Set in one of Sicily's prettiest towns, Taormina, The Belmond Grand Hotel was the first hotel built in the city, dating back to 1873. Set among a picturesque parkland filled with olives and cyprus trees, richly decorated rooms overlook the sea and the phenomenal Mount Etna. Breathtaking views are complemented with beautiful decor that recreates the splendour of the bygone era, with lush fabrics, parquet floors and ornate windows. Once the holiday destination of European aristocracy and esteemed names like Oscar Wilde and Truman Capote, this five star beauty is unrivalled in its elegance. Equipped with a relaxing pool, Sicilian style spa and scenic restaurants serving mouth watering dishes, The Belmond Grand Timeo is one like no other. Purple skies and volcano views, private terraces and an exquisite Mediterranean cuisine place the hotel unwaveringly high in the list of luxurious properties in Italy. Hotel child prices apply to 2–11 years. The hotel has 71 rooms and suites. 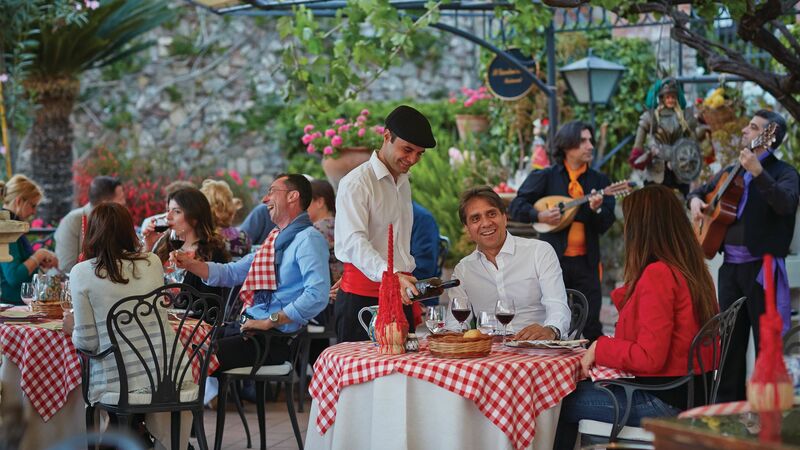 A remarkable culinary journey awaits at the most charming restaurant in Taormina. A delectable menu of Sicilian favourites are served in a beautiful terrace where you can enjoy views of Mount Etna and the peaceful Naxos Bay. Locally sourced dishes are accompanied by an expertly selected list of wines from the region for a complete and elegant dining experience. Open: 13:00 - 14:30 and 19:30 - 22:00. Underneath the shade of a pergola, a fresh and seasonal lunch menu is served at the Pool Restaurant and Bar, offering brick-oven pizzas, freshly grilled fish and a salad buffet. With panoramic views over Mount Etna and the Mediterranean Sea, this location is perfect for a poolside break. Open: 13:00 - 16:00 from mid-May to mid-September. With a phenomenal view towards Calabria, The Literary Terrace & Bar has rightfully earned its reputation as a truly seductive location. 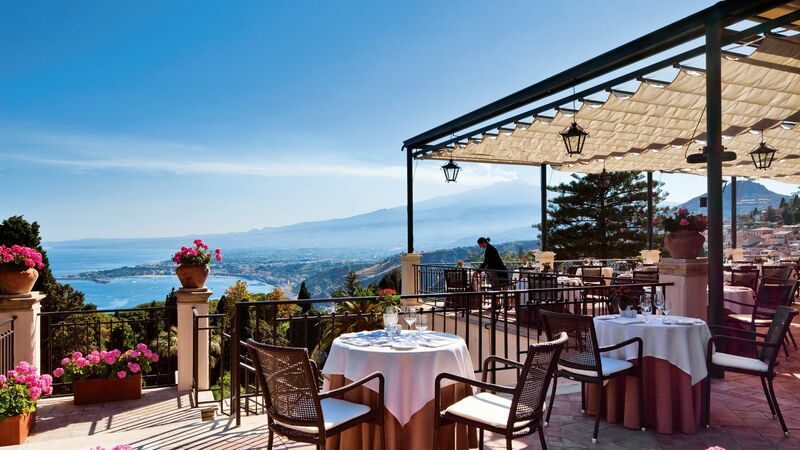 With unsurpassed views of Mount Etna and the stunning coastline, The Literary was once host to famed artists and serves classic cocktails, including the much loved Etna Spritz. Handmade Sicilian soaps and volcanic olive oil are just two of many spa sensations on offer at The Belmond’s in house spa. 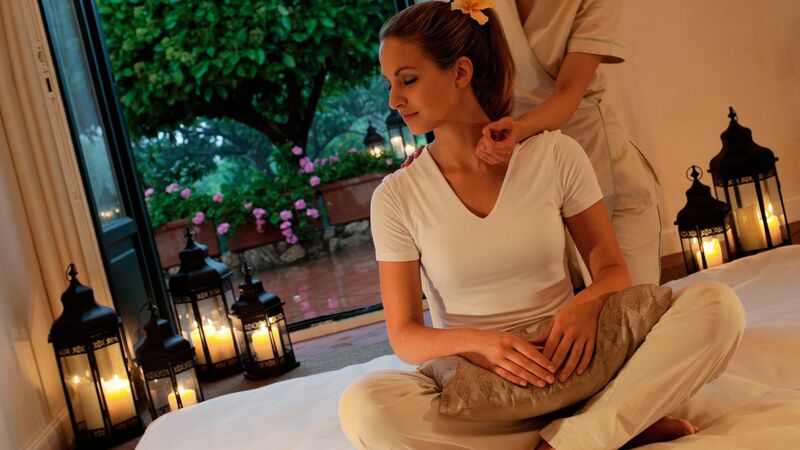 Indulge in a variety of Mediterranean special treatments, expertly designed to refresh and nourish. 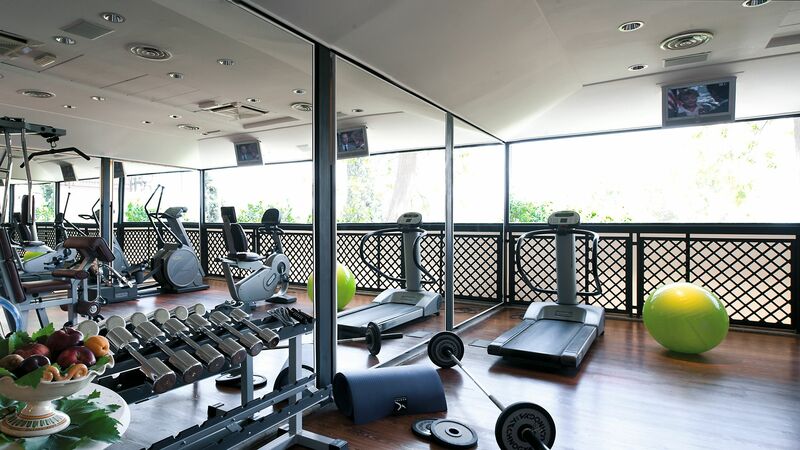 The hotel has a fully equipped fitness centre, suitable for cardio and weight training. 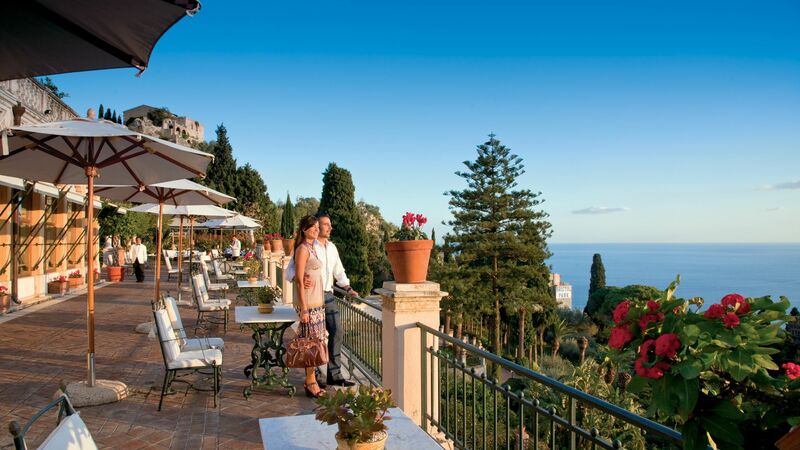 The Belmond Grand Hotel Timeo is set in Taormina, unrivalled as one of the most beautiful spots in Sicily. This beautiful hillside town holds an enviable position, with direct views of the mighty Mount Etna and Nexos Bay. On the east coast, cobbled streets are dotted with designer boutiques and a respected dining scene among historic and medieval churches, centuries old towers and the Greek amphitheatre. The upper town, Taormina Mare (accessible by a cable car) is quite the contrary, with an array of late night bars, lively restaurants and shops, as well as a shingle beach. Across the Gulf of Naxos is a stunning view of the phenomenal Mount Etna, and although visible from all over Taormina, it’s a prized and uninterrupted view like no other. The Belmond Grand Hotel Timeo is an hour’s drive from Catania Airport. Classic Twin Rooms are elegantly-appointed and aptly located in the Villa Flora annex, just 50 metres away from the main building and built within the delightful country house. Twin Superior Side Sea View Rooms are located in the Villa Flora and offer a side sea view from the private balcony. Gallery Rooms are located in Villa Flora and offer direct sea or village views. Rooms span two levels to offer a sitting area on the ground floor with an opulent bedroom on the upper level, with king or twin beds. These rooms feature two bathrooms (one with bath and the other with a shower). Twin Deluxe Front Sea View Rooms are located in the Timeo building and are luxuriously decorated to reflect a Sicilian style. Rooms offer a panoramic front sea view from the private balcony or terrace. Family Rooms are located in Villa Flora and enjoy a spacious living area and sitting room, a marble bathroom and a bedroom with either king-size or twin beds. Junior Suite Superior with Front Sea View and Balcony are decorated in a sumptuous Sicilian baroque style, with a prime location within the Timeo Building. Each has a spacious living area and sea views, with glimpses of Mount Etna from their spacious balconies. Junior Suite Deluxe with Front Sea View and Terrace are located in the main building and enjoy full panoramic sea views, where breakfast can be served for a luxurious start to the day. Suite Deluxe with Front Sea View and Balcony or Terrace are located in the main Timeo building, reflecting rich Italian baroque décor. Rooms feature separate bedroom and living rooms, marble bathrooms with separate bath and shower and a private balcony or terrace, with stunning sea views. Save up to 10% on the hotel price for holidays booked at least 60 days in advance when staying in a Double Superior Side Sea View Balcony or higher room category for holidays between 12 - 17 April 2019, 21 April - 16 May 2019 or 06 October - 02 November 2019. Beautiful hotel, gorgeous view, lovely staff from the front desk to the restaurant to housekeeping to the spa. Only downside is the bad concierge service so make sure you book your restaurants yourself. This hotel and its amazing staff delivered lifetime memories on our vacation. First class in every way, it is stunningly gorgeous with its interior design and the perfect location for views of Mt Etna and the sea below. The front desk team and service staff are truly world class. My wife took ill, and manager Julia went beyond the call of duty in assisting her with special comfort food, help with airline boarding passes, and extended check-out. In addition, the breakfast menu offers many delicious options?? ?including a buffet?? ?and a beautiful panorama of the sea and mountains. Hotels do not get any better than this one. A must-visit when in Taormina. Thank-you for the team for providing us with one of our best vacation hotel experiences ever. We spent a week at this hotel towards the end of March - just before the real season begins and therefore just within our budget! Everything was fantastic, which you'd expect for a way-beyond-five star hotel such as this. In particular the gardens are amazing, full of orange and lemon trees in fruit, and the views of Etna and the coast from the terrace simply unbeatable. We didn't dine in the restaurant, but had lovely leisurely breakfasts looking at the gently smoking volcano in the background, and enjoyed the snacks available in the bar on several occasions. The staff were all flawless in their care of the guests and responsiveness to requests, and we were sorry to say goodbye after a very indulgent week. It would be nice to go back some day - you just know that the standards will never drop and the hotel won't disappoint! Our company picked this hotel for stay in Taormina and my wife and could not have imagined anything more beautiful. Our view from our terrace was priceless, breakfast each day was a treat to start the day as we looked up at Mama Etna. The staff & service...excellent. We enjoyed a few nights in the Piano Bar and we look forward to a return someday! We popped in here late morning/early afternoon for cocktails, after visiting the Roman theatre. It is a lovely spot with beautiful views across the bay and of Etna. Not cheap, but nice for a treat, or a special occasion.